STATS Group was contracted to assist with the isolation and abandonment of a 10” oil pipeline in the Gulf of Mexico, at a water depth of approximately 25 metres. The project requirement was to supply personnel and equipment to complete subsea hot tapping and plugging at two locations to facilitate the removal of a short section of pipework as part of a decommissioning project. Once the pipeline was successfully isolated, purged and cut, a mechanical connector with a blind flange was installed to terminate one end of the pipeline and the other end was fitted with a full bore valve and blind flange. STATS patented BISEP®, which is deployed through a mechanical hot tap clamp and slab valve, was selected as it provides leak-tight isolation of pressurised pipelines through a single fitting. 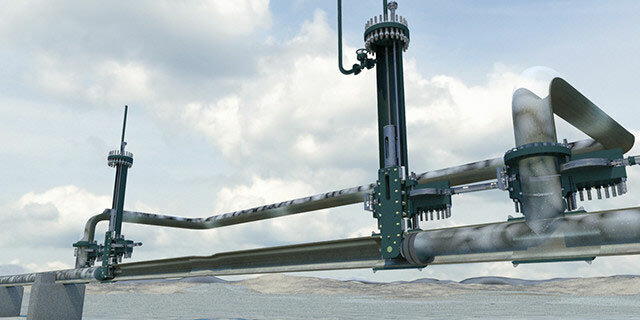 The BISEP offers significant safety advantages over traditional line stop technology as the hydraulically activated dual seals provide fully proven and monitored isolation of the pipeline inventory throughout the entire project. A key project requirement was to flush the isolated section and ensure all the oil was removed prior to cutting the pipeline and recovering it to the vessel. STATS utilised the integrated port on the BISEP launcher to attach a downline from the vessel to each BISEP launcher (upstream and downstream) allowing the pipe section to be flushed with seawater. This feature, exclusive to the design of the BISEP, prevented additional hot tapping and reduced the number of fittings installed on the pipeline, which saved the client time, money and reduced risk to the project. Once the section of pipe to be removed was successfully cleaned and purged, the pipe was then cut behind each BISEP and safely recovered to the vessel. End connectors were then installed on both ends of the pipe and two new sections of pipe were installed consisting of two flushing ports, a barred flange and a 10” ball valve. Following installation of the new pipe sections and with the BISEPs continuing to isolate the pipeline, a leak-test was conducted against the rear of the BISEP. Once the new section of piping was proven, both BISEP’s were unset, retracted and recovered to the surface. Completion plugs were installed in both mechanical hot tap clamps and the slab valves were removed and recovered to the vessel. The pipeline was then flushed through the ports on the new section of pipe to verify that all the oil had been removed. Once the pipeline had been verified clean, the flushing hoses were recovered and the new section of pipe was removed. A blind flange was installed on one end of the connector, effectively abandoning the section of pipeline running to the land-based facility. Another blind flange was installed on the 10” ball valve securing that section of pipeline and allowing for future tie-ins.